Cliffs are common coastal features. They formed by a combination of erosion and weathering, weathering working on the upper parts of the cliff and erosion wearing away the base of the cliff. Steep cliffs are formed where the land consists of hard, more resistant, rocks, their height obviously being determined by the difference between the sea level and the level of the land. Hard rocks erode and weather slowly, and the less fractured the rock is, the better it will resist breaking down. Igneous rocks such as granite and basalt form rugged vertical cliffs such as those along the Cornish Atlantic coast at Lands End. Granite is a very strong rock and such cliffs can withstand constant pounding by Atlantic storm waves. Softer rocks, such as clay, shale and some sandstones erode more easily and can create more gently sloping cliffs, although this is not always the case. Sedimentary rocks that have been laid down in distinct strata may dip towards the sea or away from it. This has the effect of either presenting a smooth surface towards the sea or a rough broken surface. A smooth angled surface will better resist waves than a rough broken surface, so the same rock can form different types of cliff according to how the rock surfaces face the sea. Generally though, remember that hard rocks form steep cliffs and soft rocks and badly broken/fractured rocks form more gently sloping cliffs. Hard rocks are more resistant than soft ones, and will form steep cliff faces. 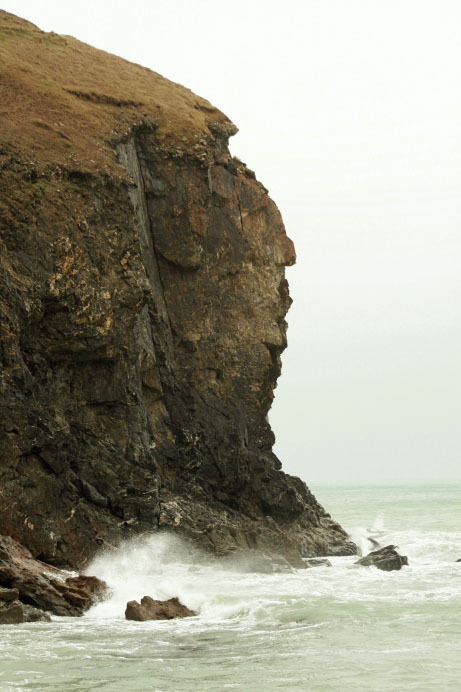 This nearly vertical cliff on the north Cornish coast has been formed from basalt, a very hard igneous rock. Despite being exposed to the full force of the sea and frequent gales, it remains almost vertical. Much of the north Cornish coastline is formed by steep cliffs of igneous rocks such as basalt and granite. Waves striking these cliffs may have been formed hundreds of miles away and can be both huge and powerful. Despite this the cliffs remain nearly vertical and show little evidence of erosion. At the base of soft cliffs, such as chalk, it is common to find large mounds of freshly weathered and broken material. At the base of this cliff are a few large blocks of rock, all old and encrusted in sea life. No fresh material is evident at all. 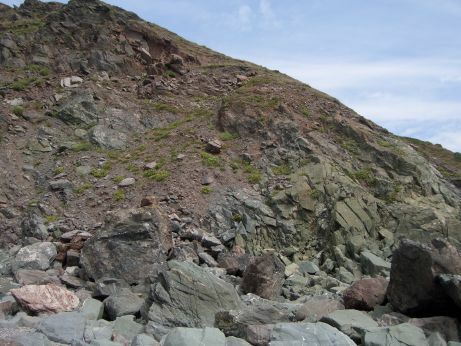 Heavily fractured and weakened rocks have formed gently sloping cliffs in this photograph. Although the rock is basalt, and thus very hard, it has been heavily fractured and broken into small chunks. These lack strength and have easily been weathered away. Erosion at the cliff base is active, more material from the cliff top is constantly replacing the material removed from the base. Sedimentary rocks such as chalk can form steep or vertical cliffs when the chalk is harder than usual. 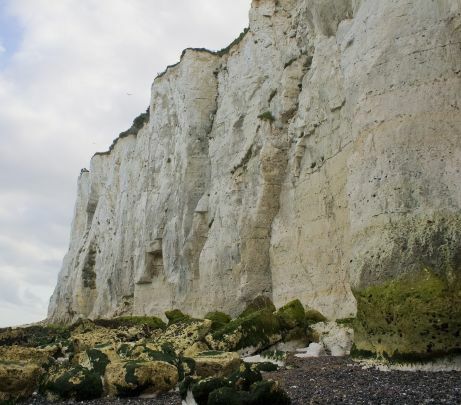 These cliffs, near Dover in the UK, stay white and vertical because they are constantly eroded and thus losing the outer layer of the rock face. The base of the cliffs is strewn with boulders, the remains of previous cliff faces that have been undercut and then collapsed by the combined forces of waves, rain and gravity. Where the cliffs have receded a wave cut platform has been created. This extends to the left of this photograph for about 50m.